Everyone knows that I'm a John Buchan fan-girl, so no big surprise that here I am once again, writing about one of his books. I owe a great deal of thanks to blogger and literati extraordinaire Kate MacDonald for without her guidance (and love of John Buchan) I might have overlooked this smashing novella published in 1913. THE POWER HOUSE is not really long enough or taxing enough for a novel so it can easily be read in one afternoon or evening. 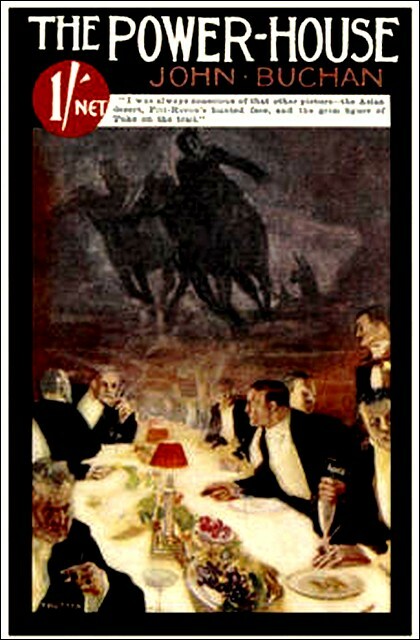 The story was first serialized for Blackwood's Magazine, then published in book form in 1916. It is told in a fast and colorful first person style with lots of theatricality and the sort of behind the scene machinations of the nefarious kind that I, for one, enjoy reading about - especially when it involves pre-WWI British society at a time when anarchists apparently lurked under every rock. A whiskey and soda or for those of us less hearty, a bracing cup of tea, makes a nice accompaniment. Besides Richard Hannay, Scottish born author John Buchan created several other worthy heroes, Sir Edward Leithen being one of them. I had never read any Leithen books before, so again I thank Kate MacDonald for the nudge. Sir Edward is a barrister, minor member of Parliament and man about London but he views himself as a stick-in-the-mud sort. He likes the law and dusty old books, yet still enjoys his clubs and the friendship of many. He is intelligent, supremely ethical, knows everyone who's anyone, but most importantly, he is a gentleman - back when that word meant something important and instantly identifiable. But back to the story: Sir Edward Leithen will become involved in a dark conspiracy of the sort only workable once upon a time when it seemed as if power could be grasped by a handful of men bent on re-negotiating the status quo for no other reason than because they could. At any rate, one night at their club, Leither learns from his friend Tommy Deloraine, that another mutual friend by the name of Charles Pitt-Heron, is apparently headed for deep trouble having just recently bolted for parts unknown leaving a very worried wife - someone whom, by the way, Leithen had once fancied. Deloraine explains that he's going after Pitt Heron to try and bring him to his senses or at least, save him from himself or whatever is wrong with him. Leithen scoffs a bit, but wishes Deloraine well in his quest and no, he will no be going with him, he has too much going on at the moment and it's probably all just a mare's nest. "It's old Lumley. Have you ever met him? He doesn't go out much, but he gives a man's dinner now and then, which are the best in London. No. He's not a politician, though he favors our side, and I expect has given a lot to our funds. I can't think why they don't make him a Peer. He's enormously rich and very generous, and the most learned old fellow in Britain." In the meantime, we learn that Leithen's friend Tommy Deloraine has left for Russia on the trail of their mutual friend Pitt-Heron who may or may not be in deep trouble. Leithen, as mentioned, remains behind and it is from him that we get the full story as it happens. Rather than decamping for an adventure in the wild, Leithen takes his own tack. Though we do get regular updates as to what the two travelers (Deloraine and Pitt-Heron eventually meet up) are up to though not in Russia as it turns out but elsewhere equally fascinating and off the beaten track with desert wastes and camels and bad guys hot in pursuit. Seems an odd way to structure a tale like this, but John Buchan makes it work. (I suspect if he'd wanted to enlarge the story and take us out of London he could have easily done so, the novella would have become a full fledged novel - there is certainly enough story for it). But our main character stays behind in London while others go off to have adventures that we may or may not hear about. Yet in a series of improbably interconnected coincidences held together by intelligent deduction, he soon has his own dilemmas and mysteries enough to deal with. What is 'The Power House' and where does Andrew Lumley, wealthy recluse revered by many, fit in? "...supposing anarchy learned from civilization and became international...Suppose that the links in the cordon of civilization were neutralized by other links in a far more potent chain." "Ir's a horrible idea, I said, 'and thank God I don't believe it's possible. Mere destruction is too barren a creed to inspire a new Napoleon and you can do with nothing short of one." "...All that is needed is direction, which could be given by men of far fewer gifts than a Bonaparte. In a word you want a Power House and then the age of miracles will begin." A splendid tale of chicanery, skulduggery and bizarre doings which stops just inches short of the absurd. The kind of thing they don't tell today probably because readers have gotten too sophisticated for such goings on. But back in the day, this was the sort of story that thrilled. Come to think of it, it still reads pretty thrillingly today. Since it's Friday once again, don't forget to check in at author and Edgar Award nominee Patricia Abbott's blog, Pattinase, to see what other forgotten or overlooked books other bloggers are talking about today. Never read this one - thanks Yvette. Actually, been a long time since I read Buchan at all ... hmmm, must try harder! You really should, Sergio. If you like this sort of thing, that is. My guess is that you're a more modern chap. :) Anyway I messed up the review with imperfect memories and had to go back and re-edit. Apologies for that. It is raining today. It rained yesterday, and it will rain tomorrow. This Buchan novella sounds like the perfect companion on such a day. It really is, Pat. I'm a sucker for this sort of story. But as I'm mentioning now, I had gotten my memories mixed and had to go back and re-edit today's post. Sorry for that. But no matter what, you can't go wrong with Buchan. I am so relieved to read your apology for your memory! I thought it was just me! Often, when I finish a book, I can't remember the names of the characters, I mean RIGHT after I finish it. With a real book, I can flip back to refresh / restore my memory, but that's too hard to do with e-books. I'm glad you mentioned the Buchan book because a while ago I read and enjoyed Huntingtower, after reading your post about it, and I've been meaning to read the other two books in the Dickson McCunn (had to go look that up just now) series. I'm glad you liked HUNTINGTOWER, Joan. I've read it three times already and will probably be reading it again at some point. Just a lovely lovely book. My kind of hero, my kind of adventure. :) The other two Dickson McCunn books are wonderful too. I reviewed them - I think. I got all three McCunn books in an anthology format for Kindle. But I also have the actual book for HUNTINGTOWER. The other two aren't as easy to find in hardcopy. First, speaking of thrills, the cover! Then, of course, there's old Lumley, of whom, I, too, wish to know a good deal more. Too rich and wise not to be a tad sinister, if you ask me. I doubt Buchan's books are on Kindle, tho, which means I'm depending on you, Yvette, to keep me abreast of his shenanigans. Oh, lucky for you, John Buchan's books are easily available on Kindle for very little money.